Shares of PNB Housing Finance surged 9.14% to Rs 798 per share after the company said it has raised Rs 2,450 crore through commercial papers. Shares of other financial services companies also gained. The Nifty Financial Services Index was up 2.2% led by Indiabulls Housing Finance, which rose 8.07%, IIFL 6.4% and HDFC 5.9%. Lupin shares rose as much as 4.27% to Rs 914 per share. The company posted a 41.5 percent fall in second-quarter profit on Wednesday, hurt by higher expenses. Net profit was Rs 266 crore in the quarter ended Sept. 30, compared with a profit of Rs 455 crore a year earlier, Lupin said. Analysts on average had expected a profit of 2.73 billion rupees, according to Refintiv data. Tata Motors shares traded 0.54% down at Rs 176.35 per share ahead of its second-quarter earnings due later in the day. Tata Motors is expected to report a consolidated net loss of Rs874.4 crore on consolidated net sales of Rs72,976.7 crore, according to a Bloomberg poll of six analysts. Adani Enterprises Ltd reported a consolidated net profit of Rs 172 crore in the quarter ended September 30, compared to a profit of Rs 59.08 crore last year. Consolidated revenue from operations stood at Rs 9,155 crore in the September quarter, up from Rs 8,546 crore in the same period last year. Shares traded 0.95% up at Rs 170.60 per share.Ramco Industries Ltd reported a net profit after tax of Rs 26.3 crore in the September 2018 quarter compared to a profit of Rs 22.05 crore a year ago. The quarter’s income from operations was Rs 187 crore in the quarter ended September 30, compared to Rs 161 crore a year ago. Shares rose 0.42% to Rs 190.90 per share.Cochin Shipyard Ltd’s September-2018 quarter profit rose to Rs 148 crore compared to Rs 100 crore in the same period last year. Revenue from operations came it at Rs 799 crore in the quarter versus Rs 583 crore a year ago. Shares jumped 2.06% to Rs 389. 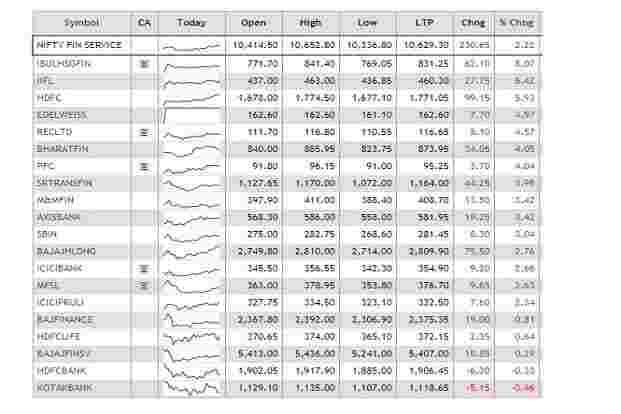 The BSE Sensex rose 369.91 points, or 1.09%, to 34,261.04, while the Nifty 50 gained 128.80 points, or 1.26%, to 10,327.20. Escorts Ltd reported a net profit of Rs 103 crore in the quarter ended September 30, compared to a profit of Rs 77.56 crore in the last year. Revenue from operations rose to Rs 1,398 crore in the September quarter from Rs 1,212 crore in the same period last year. Shares gained 1.6% to Rs 614 per share. Dabur India reported a consolidated net profit of Rs 377 crore in the quarter ended September 30, compared to a profit of Rs 362 crore last year. Consolidated revenue from operations stood at Rs 2,125 crore in the September quarter, up from Rs 1,959 crore in the same period last year. Share traded 0.39% down at Rs 391.55 per share. The Government’s three per cent stake sale in Coal India at a floor price of Rs 266 apiece opened for bidding by institutional investors today with a subscription of over 24 per cent shares on offer in initial hours of trade. Coal India shares traded 3.23% down at Rs 266.90 per share. FDC Ltd shares rose 2.63% to Rs 207 per share after the company said it has received an EIR from the USFDA for its Aurangabad facility, indicating that the site is considered to be acceptable with regards to current Good Manufacturing Practices. Tech Mahindra shares surged as much as 8.31% to Rs 740.50 per share. The company on Tuesday posted a better-than-expected 27.3% rise in second-quarter net profit, as it clocked more deals in the July-September period. Net profit was Rs 1,064 crore in the three months ended 30 September, compared with Rs 836 crore a year earlier.Motilal Oswal maintained “Buy”, with TP of Rs 800. “The softness in Enterprise offsets the strong performance and commentary on Telecom, driving a minor downward revision to our revenue estimates. However, the strong margins performance comes in as equipoise, leaving earnings unchanged,” said Motilal Oswal in a note.Prabhudas Lilladher retained “Buy” on the stock, with TP of Rs 885. “We believe that 5G led uptick can be a potential trigger for Communication vertical in FY20E. We see scope for cyclical upturn in Telecom vertical (41% of Tech M’s total revenues) in FY20E which could swing consolidated revenue growth trajectory in FY20E,” it added. Strides Pharma Science Ltd reported a consolidated loss of Rs 12.01 crore in the quarter ended September 30 versus a profit of Rs 8.59 crore last year. Consolidated revenue from operations stood at Rs 733 crore in the September quarter compared to Rs 769 crore in the same period last year. Shares fell over 4% to Rs 394.20 per share after results, but soon recovered to trade 0.31% up at Rs 414.50 per share. Tata Steel shares fell as much as 6.19% to Rs 530.10 per share. The European Commission has opened a deeper investigation into Thyssenkrupp’s planned steel joint venture with Tata Steel over concerns that it could raise prices and harm competition, reported Reuters.The Commission identified three areas where the combination of both companies’ specialty flat carbon steel and electrical steel products could give them a dominant position: steel for the automotive sector, metallic coated steel for packaging and grain oriented electrical steel, according to the report. 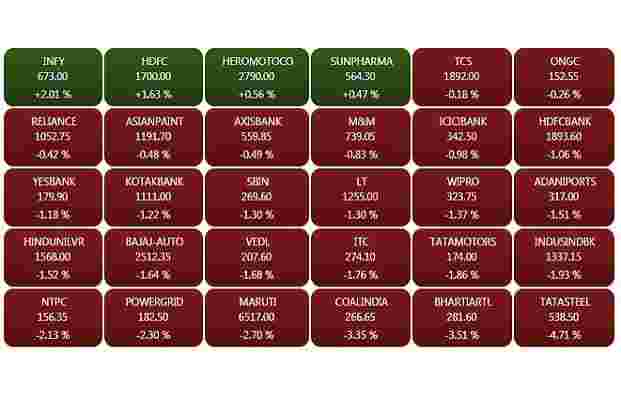 The BSE Sensex falls 272.24 points, or 0.80%, to 33,618.89. The 30-shares index hit a high of 34,050.12 and a low of 33,587.24. 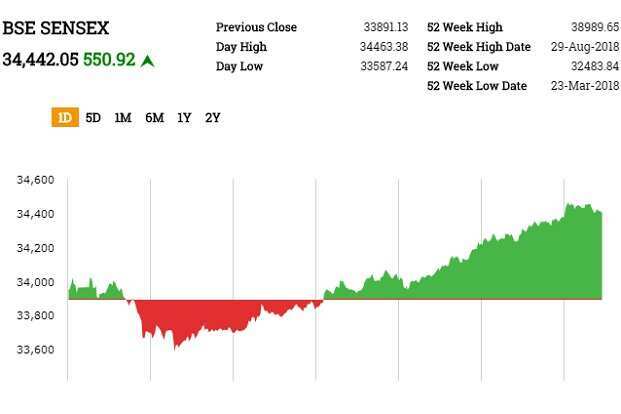 The Nifty 50 was down 76.35 points, or 0.75%, at 10,122.05 after shuttling between 10,246 and 10,105.The BSE MidCap and SmallCap declined 0.35% and 0.24%, respectively. All the sectoral indices on BSE, barring IT and teck, traded in red with metal and telecom fell 2.83% and 2.08%, respectively. 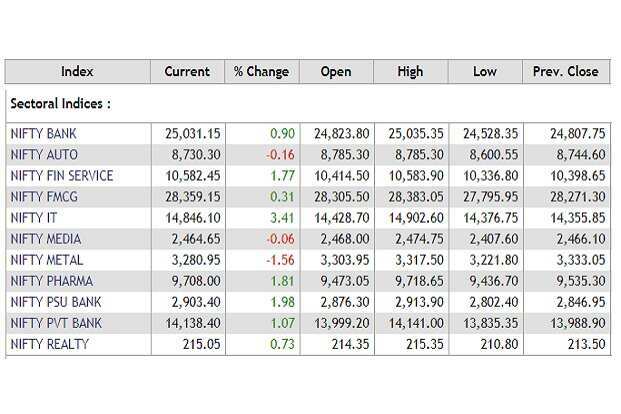 Basic materials, utilities, FMCG, Bankex and power were down over 1%. Bank of Baroda shares rose 4.6% to Rs 115.05 per share after the bank reported a 20% jump in its net profit to Rs 425 crore in September quarter from Rs 3.55 crore a year ago. However, the stock trimmed early gains and traded 1.05% up at Rs 111.15 per share. Shares of Cummins India Ltd surged 14% to Rs 768.5 per share after the company reported a 38.4% increase in its September-quarter net profit to Rs 211.60 crore. Revenues were up 29% to Rs 1486.90 crore. Shares of Dr Reddy’s Laboratories Ltd fell as much as 6.64% to Rs 2,425 per share after the company disclosed that it has received a Form-483 with eight observations by the USFDA completed the audit of the company’s manufacturing facility at Duvvada, Visakhapatnam..
Coal India shares declined 4.38% to Rs 263.80 per share after the government said it will sell 3% stake in the company with an over subscription option of selling additional 6% stake as offer for sale to public. The floor price is set at Rs 266 per share. The amount to be raised would be around Rs 14861 crore, including the green shoe option. Offer will open on Oct. 31 and end on Nov. 1.